Ronjo.com is excited to bring you our EXCLUSIVE effect – the Alotta Mug by Gary Brown. • an everyday object, rather than a stage prop. • lightweight and easy to pack. 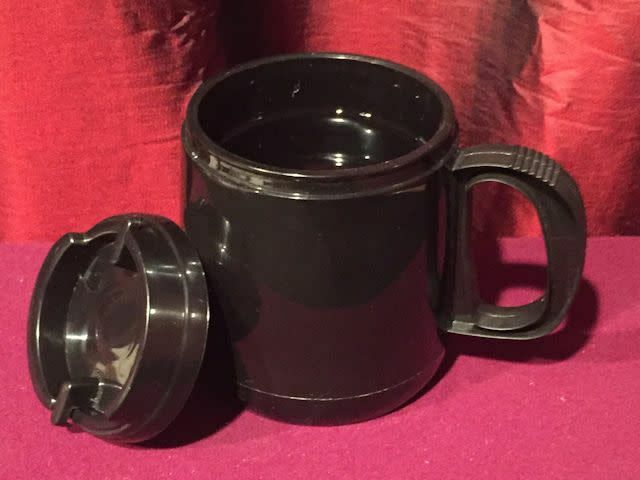 And yet, this little wonder packs the same comedic punch as a traditional Lota effect: Empty water from the mug, slowly and deliberately, making it clear that not a drop remains. You can even have spectators peer into the mug to verify that not a drop remains. A moment later, magically, you pour water from it again! Repeat this several more times. Open your show with it. Use it as a running gag through your show. Finally, close your show with it! Self Working! Easy and fun to do. Perfect for kid shows, restaurant work, bar magic, birthday entertainment, corporate events, etc. One quick note for magicians: the mug is capacious, holding, as David Oliver noted in his review, approximately 35 ounces of liquid. Because of its unique design, the amount of liquid diminishes with each pour. There are several techniques you can use enhance the effect – including the height and timing of the pours, and/or the use of a graduated receptacle. Either way, it’s an amazing thing to see. The mug is also supplied with a lid, which can be employed to your advantage in a close-up situation. David’s right – you should get one before they’re gone. Exclusively from Ronjo.com. P.S. Still not sure? Click here and Ronjo himself will give you a demonstration!